inlays by simply removing the sleeve from the bushing to cut the matching shape. 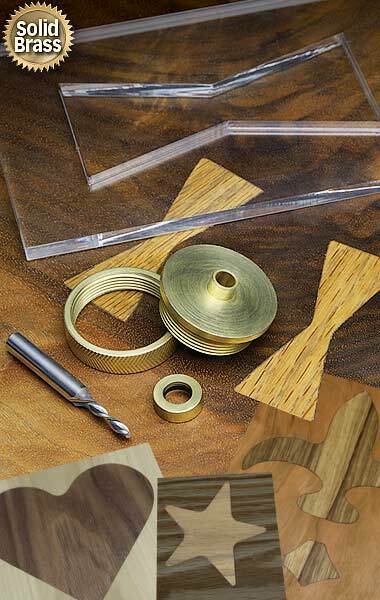 This solid brass inlay kit will fit your Porter Cable®, Black & Decker or any router with a manufacturer supplied adaptor for Porter Cable® bushings. 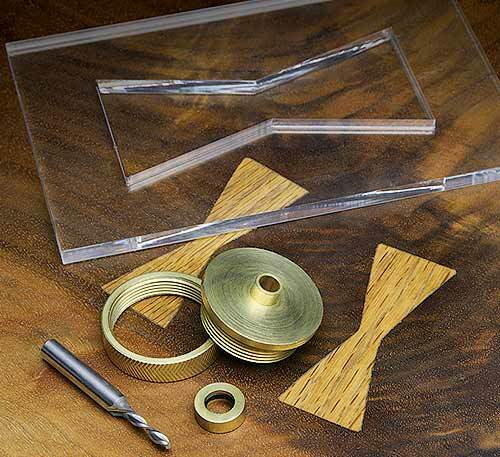 The kit includes a brass bushing, brass template guide and a brass retainer nut. A 1/8" downcut solid carbide spiral bit (item #5161) is required. SAVE $17! Includes #9180 plus #5161 solid carbide spiral router bit. List $38.90. I build a lot of large items and my customers like wide boards for all exposed sides which is hard to do and not finding any defects. I use the inlays to cover holes and cracks. By using a different species it adds character and custom look that they love. Sized to work with our Router Inlay Sets! Save time and money with the MLCS inlay kit patterns. By popular demand, MLCS is pleased to offer these patterns made of 3/16" thick, tough, shatter resistant, durable plastic. The patterns are sized to work with our inlay kit to produce the desired pattern. 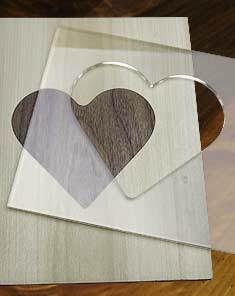 These shapes can decorate and enhance your project with popular designs such as hearts, diamonds, bowties, and more. SAVE $38.65! Inscludes 2 Bowtie (large and small), Diamond, Star, Fleur de Lis, Oval, and 2 Heart (large and small) inlay kit patterns. The Value for the kit is good. To get perfect inlays it takes a bit of practice but it is worth every min. Would like to see two bits in the kit.